Poll: What do you think of this card? Join the discussion on our forums! Come discuss Ice Fishing over in our dedicated Ice Fishing discussion topic. Draw 2 Murlocs from your deck. 2 mana draw 2. Very nice. Will it give you two Worthless Imp-like cards when you're out of murlocs in your deck? Probably, but would it be Murloc Scout, Murloc Tinyfin, or a brand new token? Hmm. Interesting to say the least! This actually is applicable with Unite the Murlocs and many other Murloc cards. This is comparable to Sense Demons, but is much cheaper for a tribe with much more synergy! It's also one mana cheaper than Arcane Intellect, which is quite good since both cards fetch things you put into your deck purposely. Not sure if it'll actually see play, but definitely opens up more Murloc-based decks and ideas. Better than Sense Demons 1 mana less. Am I the only one think that this card is so CUTE ? 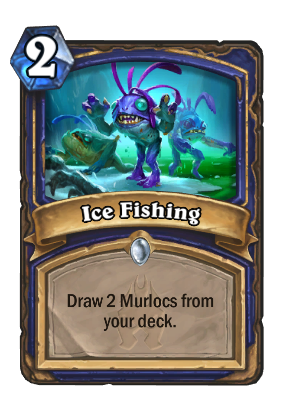 fishing ice murloc? the paw paww? Is there a corner of Azeroth that doesn't have Murlocs? I'm afraid that Murlocs are the token creature in WOW that shows up everywhere and are impossible to get rid of. Card is very good but shaman quest isn't strong. If we see great murlocs it can be ok but like this, probably not gonna see play. But 2 mana and draw 2 specific card without overload. It's too strong. Back in the day I was using Ancestral Knowledge in my Everyfin is Awesome deck, but when you actually want to draw specifically a couple of murlocs most of the time this card is better... might make Shaman quest viable. Reducing initial hand size by one and paying that one mana is really bad in an aggro deck. This card isn't broken or anyfin, but it's certainly better than Shaman Quest. You can completely whiff on creatures with Coldlight Oracle. This guarantees you bodies. Wow... and why cost Demon Sense still (3)? ._. Not fair, Blizzard. Not fair. Maybe 'cause it don't call 1/1 demons if you don't have another murloc? Yeah sure average demon is so much weaker than average murloc... NOT!